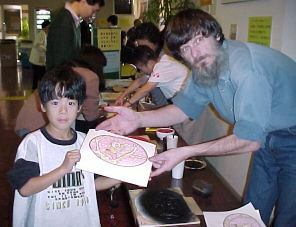 Best activity in Tokyo - make your own woodblock print! 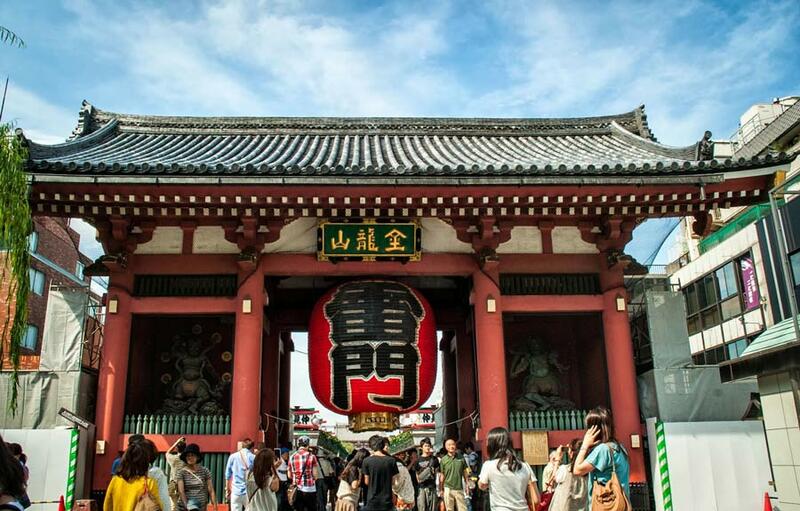 A 'don't miss' activity next time you're in Tokyo! What goes on? - pre-carved woodblocks, tools and all the equipment for printing is prepared. The Mokuhankan staffers will take you through the process of making your own prints from them. Where does it happen? - the Mokuhankan workshop is located in the popular district of Asakusa. 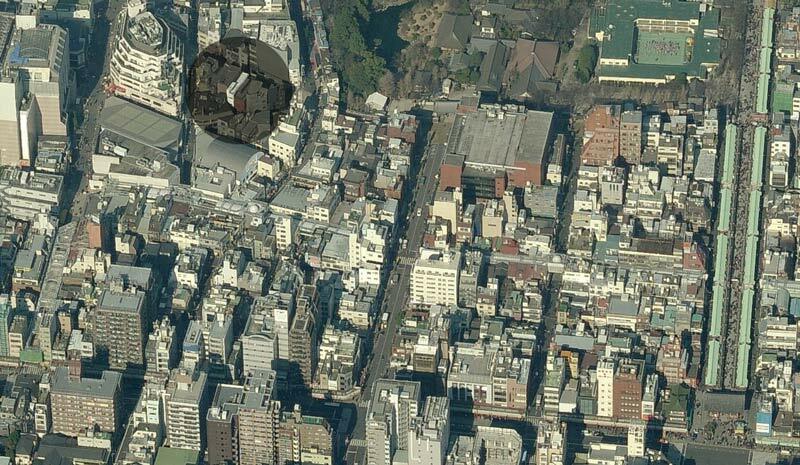 To get to our place from the steps of the main Sensoji Temple takes less than two minutes! ... so while you're in the neighbourhood, stroll over to Mokuhankan and make yourself some woodblock prints! And of course we have a shop here too, where you can browse and hopefully find interesting items for yourself, or as souvenirs for friends and family back home. This is also a wonderful way to spend part of a rainy day in Tokyo! 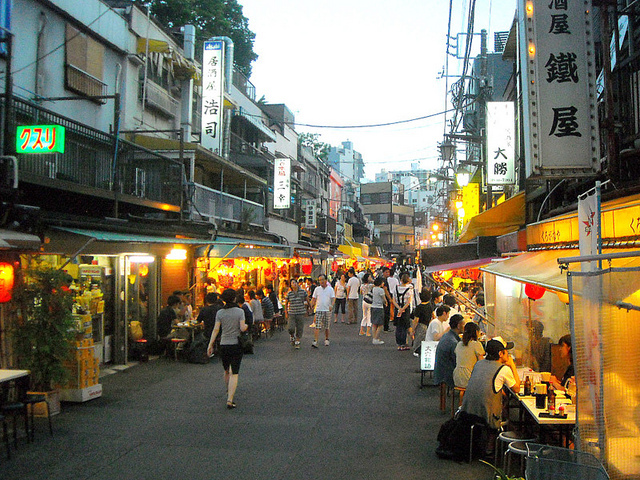 Our shop is on the south side of the famous 'Roku-dori', one of the most interesting streets in the Asakusa area of Tokyo. 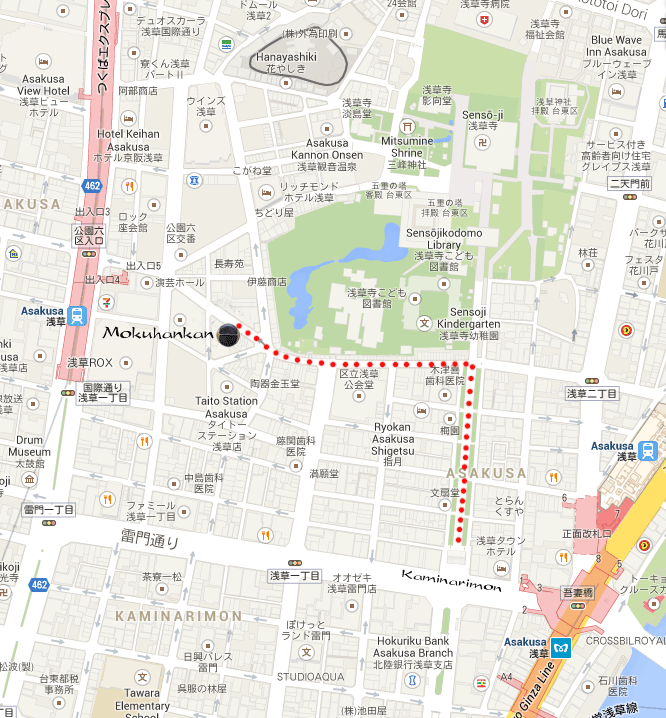 The street address is: Asakusa 1-41-8, Taito-ku, Tokyo. Our phone # is 070-5011-1418, and the shop hours are 10:00 am to 5:30 pm (closed Tuesdays). When you're on your way to our place, you can watch this video [(coming soon)] walking that same route to help you get here. There is also an alternate route [(coming soon)] for that rainy day, that stays mostly under cover. Also, do you see the other train station - just to the left of us on that map above? That's the Asakusa Station for the new Tsukuba Express, which you can catch at Akihabara ... which is surely on your itinerary, no? Please note that any children present must be part of a family group; we cannot do the activity for children only. We have three or four 1-hour Parties scheduled most days; their starting times are shown here. Numbers in  brackets are the spaces available. Choose the time you wish, and click it to bring up the reservation form. Time slots in red are full up (or not available). If you wish to reserve a time farther down the line than is shown on these calendars, please just use the Contact Page to let us know what you want. Depending on staff availability, we sometimes also offer another time slot not listed here - 16:00. If you would prefer one of those times, please just write and ask. If you have previously made a reservation, and want to change something, please use our Contact Form to let us know. I thought so. You have no idea. So we offer a "Jog me, please!" service. If you think you might be interested in joining a Print Party when you are here, but don't yet know when/if you will be available, use our Jog Me! form to give us your name, email, and anticipated date of arrival in Tokyo. The form allows you to select how and when you would like to be reminded about these Parties. We don't do any cooking here at Mokuhankan, but we have a great idea for those of you who like to put on the Chef's Hat. Ms. Yoshimi Daido - a most elegant and wonderfully conversant young Japanese lady of our acquaintance - runs Tokyo Kitchen, "a place where you can learn to cook authentic Japanese home dishes in English in a friendly atmosphere." 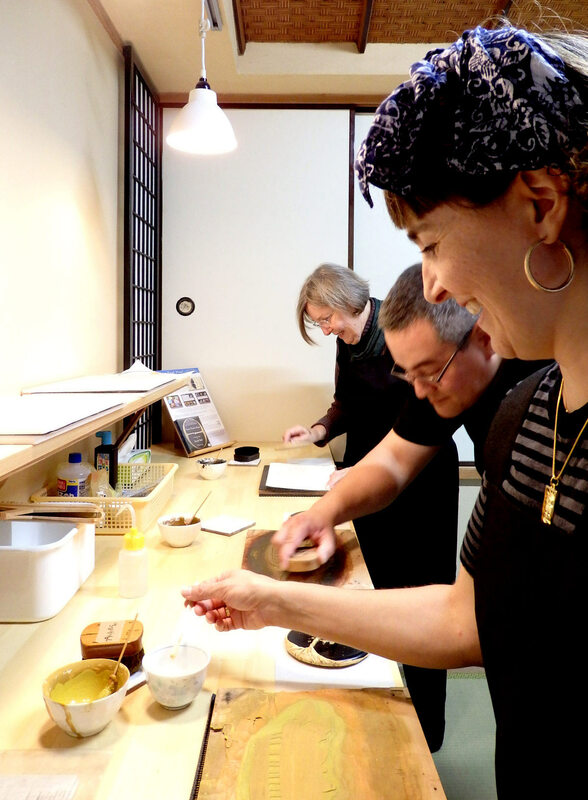 She's located about a four~five minute walk from us, and it would be a great way to spend a day in Asakusa: cook up a storm at her place in the morning, eat your own creation for lunch, then stroll along Denpo-in street to Mokuhankan for an afternoon Print Party. But this photo - showing the evening scene just a 5-second stroll from our front door - might just give you a feeling for what our neighbourhood is like! The Print Parties had their start back in 1989, when Dave carved a simple set of four blocks and took them to the 'Culture Festival' being held at a local community center. He prepared four brushes, four bowls of pigment, and four printing barens, as well as a thick stack of paper. Within a few minutes of opening up in the morning he had a line of people waiting their turn, and the action didn't let up until the event was over that evening. Hundreds of people made their way along the table, using the tools and materials - under his watchful eye and guidance of course - to make their own woodblock print. It was so popular that it became a regular part of the annual Festival, and he took a fresh set of blocks along every year. Skip ahead to 2012 and the start of the Kickstarter campaign for the Ukiyoe Heroes woodblock prints. Jed and Dave were thinking of ways to make the campaign more interesting, and decided to include an option for any backers who might be planning to be in Japan soon, to visit Dave's workshop for a 'Print Party', based on the same kind of activity. It was limited to 12 backers, sold out in minutes, and the parties were hugely successful! So here we are; based on those experiences, Dave has set up a room in his Asakusa workshop specially dedicated to Print Parties! And you don't have to line up, because you can book in advance!